Tropical North Queensland rainforest is to experience nature at its finest! Rail or Gondolas with amphibious Army Ducks all come together to enable you to appreciate the compelling enchantment of the rainforest. The rainforest village of Kuranda, Aboriginal dancing, a Dreamtime experience, and native animals complete a special day. 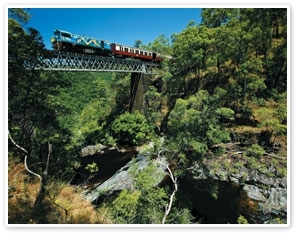 You must choose whether you wish to travel on the Kuranda Scenic Railway OR Skyrail Rainforest Cableway. Experience a Dreamtime walk and learn of aboriginal culture, spear throwing demonstrations and try your hand at Boomerang throwing! Sensational panoramic views of the Coral Sea, Cairns City, lush tableland region and mountain ranges.